Antibiotics are agents which are used to kill or inhibit the growth of microorganism. This class of drugs should be used by counseling with the registered physicians; otherwise improper selection of antibiotic may develop resistance. Not only the improper selection but also some other factors, such as ignorance of patients about course of antibiotics, overuse, etc are responsible for antibiotic resistance. The survey was conducted on rational use of antibiotics to observe that whether the antibiotics are used rationally or not, and if not to find out the factors, which are responsible most for irrational use of antibiotics. Since the irrational use ultimately lead to antibiotic resistance, which is considered as everybody’s problem, so it is very much important to find out the reasons behind resistance and take some necessary steps to solve the problems. In comparison to developed countries, the irrational use of antibiotics occurs more frequently in developing or least developed countries like Bangladesh, particularly at PHC level. That is why Muktagachhha Upazila Health Complex has randomly been selected for the survey on rational use of antibiotics. Primary health care, often abbreviated as PHC, is “essential health care based on practical, scientifically sound and socially acceptable methods and technology made universally accessible to individuals and families in the community through their full participation and at a cost that the community and the country can afford to maintain at every stage of their development in the spirit of self-determination” (Alma Ata international conference definition). It was a new approach to health care that came into existence following this international conference in Alma Ata in 1978 organized by the World Health Organization and the UNICEF. The primary care in the public sector is organized around the Upazila Health Complex (UHC) at sub-district level which works as a health-care hub. These Units have both in- and out-patient services and care facilities. Most commonly, they have in-patient care support with 31 beds, while some UHC have over 50 beds. Many UHC Units have a package service called “comprehensive emergency obstetric care services” (EOC) available, with an expert gynaecologist, an anaesthetist and skilled support nurses on duty round-the-clock and basic laboratory facilities. At a lower tier, the Union Health and Family Welfare Centre (UHFWC) are operational, constituted with two or three sub centers at the lowest administrative level, and a network of field-based functionaries. The public sector field-level personnel are comprised of Health Assistants (HAs) in each union who supposedly make home visits every two months for preventive healthcare services, and Family Welfare Assistants (FWAs) who supply condoms and contraceptives pills during home visits. Recently some of the female HAs and FWAs have been trained as birth attendants (skilled birth attendants – SBAs), to provide skilled services within a household setting. The number of health assistants is determined according to the size of the population. The Health Assistants and Family Welfare Assistants are supervised by a Health Inspector (HI) and a Family Planning Inspector (FPI) respectively, posted at the union level. The UHC is staffed by ten qualified allopathic practitioners and supporting staff, while the UHFWCs are staffed by professionals such as a Medical Assistant (MA/SACMO) and mid-wife (Family Welfare Visitor), both trained in formal institutions. The Union Health and FamilyWelfareCenters (UHFWCs) provide out-patient care only. Since the inception PHC services in Bangladesh have been rendered in terms of 8 elements: health education, nutrition, adequate and safe water and sanitation, maternal and child health, immunization, prevention and control of endemic diseases, treatment of common ailments and injuries and provision of essential drugs. In the 5th five year plan, Health and Population Sector Programme 1998-2003 (HPSP), these services were remodeled as the Essential Service Package with prioritization of the most of the PHC activities. Current, 2003-2010, Health, Nutrition and Population Sector Programme (HNPSP) includes nutrition with essential service package as the essential service delivery (ESD) programme. ‘Healthcare for All’ has been the catchphrase for many developing countries of the world, including Bangladesh. According to Article 15 and 18 (1) of the Constitution of Bangladesh access to health is ensured for every citizen of the country. In 1978 Bangladesh became a signatory to the Alma-Ata Declaration. But even after over three decades of such lofty declarations Bangladesh is far from being a nation that provides access to healthcare to all its people. True, in the last 37 years of our independence there have been significant successes in sanitation. With the majority of the population being poor, underfed and undernourished and an inefficient, inaccessible public health care system, health, or rather the threat to it, has become the biggest obstacle to development. Access to healthcare, seems to be the first and most important step towards achieving the ‘Health for All’ goal. It is not as if we never had any National Health Policy. Three consecutive governments promulgated drafts of the National Health Policy in 2000, 2006 and in 2008. But health has never been given the importance in the national budget as it deserved. The government has spent around only US$ 4 per person per year, while the proposed National Health Policy 2000 set the requirement of minimum US$ 12 per person. According to the World Health Organization (WHO), however, the ideal figure is a minimum of US$ 34 per person per year in this field. This year’s proposed budget for the health sector had an allocation of only approximately 6000 crore taka including salaries and development works. Inefficiency in health governance, corruption, misuse, lack of transparency, incompetence in fund management, partition policy and favoritism result in funds not being allocated properly. ensuring uninterrupted supply to facilitate effective preventive, curative, and rehabilitative services to the vulnerable, the disadvantaged and the poor. An antibiotic is a drug that kills certain kinds of bacteria but which is generally harmless to the host and is used to treat infection. The term was originally used to describe only antibacterial formulations derived from living organisms but is now used in reference to synthetic antimicrobials such as the sulfonamides. In general, the term can also apply to substances that affect prions, viruses, fungi, worms or any other intracellular or extracellular parasite, but the antibacterial kind are the most common. Generally, the antibiotics are not effective in viral infections. The first antibiotic to be discovered was penicillin. Alexander Fleming had been culturing bacteria on an agar plate with an accidental fungal contamination, and noticed that the culture medium around the mould was free of bacteria. He had previously worked on the antibacterial properties of lysozyme, and so was predisposed to make the correct interpretation of what he saw: that the mold was secreting something that stopped bacterial growth. Though he was unable to produce the pure material (the beta-lactam ring in the penicillin molecule was not stable under the purification methods he tried), he reported it in the scientific literature. Since the mold was of the genus Penicillium, he named this compound penicillin. With the increased need for treating wound infections in World War II, resources were poured into investigating and purifying this compound, and a team led by Howard Florey succeeded in producing large quantities of the purified active ingredient. Antibiotics soon came into widespread use. The discovery of antibiotics, along with anesthesia and the adoption of hygienic practices by physicians (for example, washing hands and using sterilized instruments) revolutionized medicine – it has been said that this is the greatest advance in health since modern sanitation. They are often called “magic bullets”: drugs which target bugs without greatly harming the host. Antibiotic resistance is the ability of a microorganism to withstand the effects of antibiotics. It is a specific type of drug resistance. Antibiotic resistance evolves via natural selection acting upon random mutation, but it can also be engineered by applying an evolutionary stress on a population. Once such a gene is generated, bacteria can then transfer the genetic information in a horizontal fashion (between individuals) by plasmid exchange. If a bacterium carries several resistance genes, it is called multi-resistant or, informally, a superbug. The term antimicrobial resistance is sometimes used to explicitly encompass organisms other than bacteria. Antibiotic resistance can also be introduced artificially into a microorganism through transformation protocols. This can aid in implanting artificial genes into the microorganism. If the resistance gene is linked with the gene to be implanted, the antibiotic can be used to kill off organisms that lack the new gene. Many bacteria acquire resistance to one or more of the antibiotics to which they were formerly susceptible. Bacteria develop resistance by acquiring genes encoding proteins that protect them from the effects of the antibiotic. In some cases the genes arise by mutation; in others, they are acquired from other bacteria that are already resistant to the antibiotic. The genes are often found on plasmids which spread easily from one bacterium to another — even from one species of bacterium to another. Drug Inactivation or Modification: e.g. enzymatic deactivation of Penicillin G in some penicillin-resistant bacteria through the production of β-lactamases. Alteration of Target Site: e.g. alteration of Penicillin Binding Protein (PBP) —the binding target site of penicillins—in Methicillin Resistance MRSA and other penicillin-resistant bacteria. Alteration of Metabolic Pathway: e.g. some sulfonamide-resistant bacteria do not require para-aminobenzoic acid (PABA), an important precursor for the synthesis of folic acid and nucleic acids in bacteria inhibited by sulfonamides. Instead, like mammalian cells, they turn to utilizing preformed folic acid. This lack of knowledge is assumed to play a role in irrational prescribing (Kunin 1987). In many countries, the dispensers of drugs also may not be formally trained as dispensers or as pharmacists. In areas where diagnostic facilities are not readily available (or are entirely absent), thus making differential diagnosis, organism identification, and knowledge of antimicrobial susceptibility patterns difficult, greater amounts of antimicrobials are often prescribed to ‘cover any possible infection’ (Bosu 1997). As resistance continues to become more prevalent, prescribers may be more likely to utilize broader spectrum antimicrobials for empiric therapy and prophylaxis of infections (Yu 1991; Goldmann 1997). In Bangladesh, it was determined that 50% of all the prescriptions for antimicrobials in a hospital unit were considered inappropriate (Hossain 1982). Long treatment duration and sub-therapeutic or sub-optimal dosages have been correlated with increases in selective resistance (Rice 1990; Guillermot 1998). Fear of litigation has been suggested as one reason physicians over-prescribe antimicrobials (Fidler, 1998). In countries where physicians are underpaid, pharmaceutical companies have been known to pay prescribers a commission for prescribing their products (Norrby 1996). In addition, pharmacists and dispensers gain financially from over-dispensing and through dispensing more expensive broad-spectrum agents when cheaper narrow spectrum agents would suffice. It is recognized that often the main resources of drug information for prescribers are drug representatives and commercially oriented publications (Bosu, 1997). 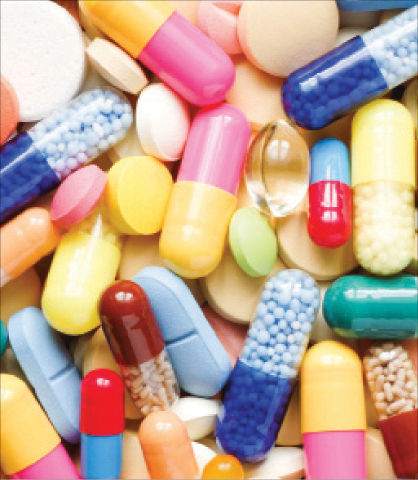 Self medication is often cited as a major contributing factor to drug resistance (Vuckovic 1997). In a Brazilian study, it was determined that the three most common types of medication used by villagers were antimicrobials, analgesics and vitamins with the majority being prescribed by a pharmacy attendant or purchased by the patient without prescription (Haak 1988). A lack of patient understanding and provider communication led to most instances of non-adherence (Sackett 1979; Buckalew 1986). This factor is critical as often patients who fail to complete therapy (such as in the case of tuberculosis) will relapse and require retreatment. Previous treatment is considered an important factor in the selection of resistant bacteria (Bloom 1992). A lack of access to drugs due to economic hardship has been described as a factor for impacting resistance as appropriate therapy can be interrupted. In many developing countries, for economic reasons antimicrobials are purchased in single doses and may be only taken for a couple of days until the patient ‘feels better’. This action has the potential for impacting the emergence of resistance (Couper 1997; UK Department of Health 1998). According to National Drug Policy promulgated in 1982 essential antibiotics should be used at PHC level of Bangladesh, but only about 35 percent of essential antibiotics are used now at PHC level, which is irrational. Since, the rural people are getting essential antibiotics free of cost, so there is a great chance of patient compliance, which ensures the rational use of antibiotics. Appropriate drug: The selection of drugs is based on efficacy, safety, suitability and cost considerations. Appropriate patient: No contra-indications exist and the likelihood of adverse reactions is minimal, and the drug is acceptable to the patient. Appropriate information: Patients should be provided with relevant, accurate, important and clear information regarding his or her condition and the medication(s) that are prescribed. i) perception of need – is an antibiotic necessary? ii) choice of antibiotic – what is the most appropriate antibiotic? iii) choice of regimen : what dose, route, frequency and duration are needed? iv) monitoring efficacy : is the treatment effective? Antibiotics are generally only useful for the treatment of bacterial infections. It is important to remember that not all fevers are due to infections and not all infections are caused by bacteria. The majority of infections seen in general practice are of viral origin and antibiotics can neither treat viral infections nor prevent secondary bacterial infections in these patients. Even where a bacterial aetiology is established, an antibiotic may not be always necessary. Many bacterial infections resolve spontaneously. Minor superficial skin infections may be more suitably treated with a local antiseptic. Collections of pus should be drained surgically and if drainage is adequate, antibiotics are often not required. The successful outcome of therapy would depend very much on the choice of the antibacterial agent. In the process of selecting an antibiotic, three main factors need to be considered; the aetiological agent, the patient and the antibiotic. Determination of the aetiological agent depends on a combination of clinical acumen and laboratory support. In many instances an antibiotic prescription has to be made based on the clinical diagnosis (empirical therapy). Even where a bacteriology report is available it is necessary to interpret the report. Bacterial isolates from culture specimens may represent normal flora, colonisers or contaminants rather than true pathogens. Sensitivity results when available are at best only a guide to treatment. Laboratory reports should always be viewed in the light of clinical findings. Several patient factors have to be considered in selecting an antibiotic. Age is an important factor. The very young and the very old tend to be more prone to the adverse effects of the antibiotics. Neonates have immature liver and renal functions which affect their ability to metabolise or excrete antibiotics. Antibiotics and their metabolites may adversely affect growing tissues and organs in children. Elderly patients are more likely to suffer from nephrotoxicity and allergic reactions. Dosage modifications would also have to be made in those patients with hepatic or renal impairment. Antibiotics can also give rise to severe toxic reactions in patients with certain genetic abnormalities eg sulphonamides in patients with glucose-6-phosphate dehydrogenase deficiency. Antibiotics should as far as possible be avoided in pregnancy and when it is necessary to use an antibiotic, betalactam antibiotics and erythromycin are probably the safest. A history of allergy to antibiotics should always be sought before administration. Routine intradermal test doses for penicillin allergy is of little value and may even be dangerous. The clinician should have adequate knowledge of the pharmacokinetic properties of the antibiotic he uses. Antibiotics vary in their ability to be absorbed orally or to cross the blood brain barrier and these factors will affect their routes of administration. The ability of the antibiotic to achieve therapeutic concentrations at the site of infection is another important consideration thus antibiotics used for treating urinary infections should ideally be concentrated in urine. Some antibiotics have very severe toxic effects and are best avoided in certain conditions. The doctor should also be aware of drug-drug interactions since many antibiotics can interact with other non-antibiotic drugs. Finally the cost of the antibiotic is also of major concern. In calculating costs it is perhaps more reasonable to take into account the total cost of treatment rather than just the actual cost of antibiotic per dose. The route of administration, the necessity for monitoring antibiotic levels and the patient’s length of stay in hospital can affect the cost of treatment as well. The patient’s compliance to medication is an important factor for consideration in the choice of antibiotics. Whether the route of administration should be oral or parenteral would depend on whether the patient is able to take oral treatment reliably. In cases of severe sepsis where rigors, hyperthermia/hypothermia, tachycardia and hypotension are present, intravenous therapy should be instituted. When in doubt it would be safer to commence intravenous treatment and review the treatment daily. Except for a few conditions, the optimum duration of antibiotic treatment is unknown. Many antibiotics are often presribed for duration of 5-7 days. Nevertheless it is reasonable to discontinue therapy even after a shorter period if the patient’s symptoms have resolved. There are however certain infections where prolonged treatment is necessary (Table 1.3). In some conditions eg uncomplicated cystitis in women and gonococcal urethritis in males, single dose regimens have been shown to be effective. v) achieved or the diagnosis has been changed. The use of correct drugs with incorrect administration, dosages, and duration, e.g., the use of IV metronidazole when suppositories or oral formulations would be appropriate. The use of unnecessarily expensive drugs, e.g. the use of a third generation, broad-spectrum antimicrobial when a first-line, narrow spectrum, agent is indicated. Excessive use of antibiotics for treating minor ARI. Minerals and tonics for malnutrition. There are many different factors which affect the irrational use of drugs. In addition, different cultures view drugs in different ways, and this can affect the way drugs are used. The major forces can be categorized as those deriving from patients, prescribers, the workplace, the supply system including industry influences, regulation, drug information and misinformation, and combinations of these factors. All of these factors are affected by changes in national and global practices. For example, the frequent use of injections is declining in many African countries because of the fear of AIDS. In some countries, however, the use of injectibles remains high due to false assumption of prescribers that injections will improve patient satisfaction and that they are always expected by the patients.